This year's Chrism Mass will be held at 6pm on Tuesday, 16 April 2019 at the Cathedral of the Blessed Virgin Mary. Two meaningful rituals occur during this gathering of the entire diocese - bishop, priests, deacons and lay faithful. The first is the renewal of their promises to serve God and his people by all the priests and bishops. The second is the blessing and distribution of the Holy Oils. Here Bishop Steve blesses three oils — the oil of catechumens, the oil of the infirm, and sacred chrism — which will be used in the administration of the sacraments throughout the diocese for the year. 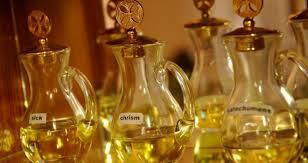 The Chrism Mass only happens once a year – the Tuesday of Holy Week, and only at the Cathedral. Come celebrate one of the most solemn and significant liturgies of our church.